We are organizing around the budget cuts and NTT non-reappointments. Let us know if you want to be part of the FSU Organizing Campaign by emailing us at FSU@umb.edu. 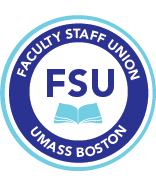 Attend the FSU meeting on October 12th, on budget cuts, bargaining, etc. (see here for details). Sign the petition opposing the cuts and course cancellations! Your presence at the April 12, 2017 Board of Trustees meeting had a real impact (see here for more! See here for a press release from the FSU on the budget cuts.